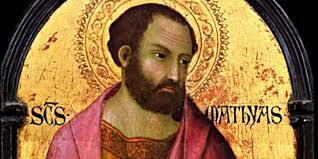 O Glorious Saint Matthias, in God's design it fell upon you to take the place of the unfortunate Judas who betrayed Jesus, his Master. You were selected by the twofold sign of the uprightness of your life and the call of the Holy Spirit. Obtain for us the grace to practice the same uprightness of life and to be called by that same Spirit to wholehearted service of the Church and our world. Most Sacred Heart of Jesus: We place our trust in You. Our Lady Queen of the Angels: Pray for us. St. Matthias Pray for us. Say One Our Father, One Hail Mary and One Glory Be each day of the Novena.